growth, next month carbon and ventilation. factor, will increase growth without having to adjust or do anything else. light is and how different types of light affect plant growth will make you a better indoor grower. Visible light is just a small part of the massive amounts of energy released by the sun, all the energy the sun emits is collectively called radiant energy. Light is sometimes called white light, because it appears white to the human eye. Have you ever used a prism to make a rainbow from a light source? A prism separates white light into its various components. White light consists of all the colors of the rainbow, red, orange, yellow, green, blue, indigo, and violet (remember ROY G BIV from junior high school?). The energy of white light is what plants use for photosynthesis and interestingly is the same energy we interpret as vision. Color, is actually how our minds interpret the various energy waves that make up white light. (there are no colors, there is only your minds interpretation of energy of different wavelengths that you think are colors— sit down and think about that sometime). As an indoor grower, it is important to keep in mind that different light fixtures emit different percentages of white light, not every light source is good for every plant. inputs required for photosynthesis and good plant growth, are light, carbon dioxide and water. flower for example. However, light intensity is also important (More below). absorb energy from various colors. More pigments help plants get more energy from white light. why some people are color blind. Some color blind people can not tell green from red because they are lacking one of three pigments in the human eye used to differentiate (absorb) these colors. dark green. A certain about of blue light is required for most higher plants to grow and flower. lead to long internode lengths and lankyness. pigments so it can contribute to photosynthesis in some plant species. activities. Some red light is required for most higher plants to successfully grow and flower. below). An interesting phenomenon of light is phototropism, when plants bend toward the light. seed germination. Red and far-red (infrared) are often associated with photoperiodism. Since plants do not wear watches or even have eyes, how do they tell night from day? Plants have a pigment in them called phytochrome that is sensitive to light. To understand the basics of light detection you just need to know that phytochrome comes in two types, light and dark. When light is hitting the plant, dark phytochrome turns into light phytochrome, and you guessed it, in the absence of light, light phytochrome turns to dark phytochrome. It is the ratio of dark to light phytochrome that plants use to measure day length. When the amount of dark phytocropme gets to a certain point i.e. the nights are a certain length, the plant will begin to flower. To be honest, plants measure the length of the night (also called the “dark period” by indoor plant growers and it is when the lights are turned off). Translation turning your lights off in the middle of the day (light cycle) to fix something, install new equipment etc. will not affect growth and flowering. BUT, if you turn the light on in the middle of the night (dark cycle), you WILL affect flowering. If you do not have a light proof room you will have “light leaks” into your garden during the “dark period”, you may end up with some very odd or no flowering responses. If you can’t devote a whole room to growing, you could try using a grow tent. Grow tents are light proof and provided an excellent “microclimate” to grow your plants in. leaves on broadleaf plants have more chlorophyll (sometimes seen as being darker green). In most cases, it is a bad idea to remove big shade leaves, they are contributing to the photosynthesis rate, and hence the growth rate of the plants. Move them so that younger leaves on that or other plants are not blocked from light. Older leaves on plants can actually have high rates of photosynthesis with lower light intensity, so don’t think the big shade leaves are being wasted if you tie them down, they are contributing to the growth rate. If they don’t get enough light, they will yellow and die, but at least this way, all the nutrients in that leaf will be used by the plant. If you are interested in flowering and fruit, which is why most of us grow, the changing day length determines when many plants flower. The change in the duration of night is why different plants flower in spring (nights longer than day) summer (nights shorter than days) or fall (nights getting longer). Temperature also plays a part in the plants life cycle and some plants just flower after a certain amount of time. Other plants need to build up specific nutrients over time to get big enough before they will flower. There are many plants that need a certain amount of darkness in order to trigger them to begin flowering. Indoor growers must know the light requirements for their plants in order to promote flowering. This is simply the ratio of how long the lights are on versus off. This can be determined with some basic knowledge: does you plant naturally (in the wild) flower in the spring, summer or fall? Spring plants will need warmth to start growing and light at least equal to dark. 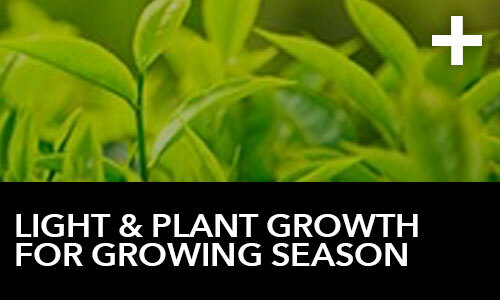 Summer plants will need a grow period and increasing light versus dark. Fall plants will need a growth period with long days followed by shorter days, light on for 12 hours off for 12 for example to simulate the shortening fall days. for certain molecular cues to go off and normal plant growth to occur. induce some plants to flower. 2. Fluorescent lamps -The fluorescent lamp is well suited for indoor plant growth, especially “High-Output” T5 fluorescent lamps. Fluorescent lamps are 3-7 times more efficient than incandescent lamps meaning you will use less electricity for the same amount of light. Fluorescent bulbs come in a wide spectrum of light, 6500K grow bulb shave more light on the blue end so they promote bushiness in plants whereas the 3000K bloom bulbs have more light in the red end of the spectrum so they promote flowering. However, these lights have a low light output, meaning you need to keep the lights within a few inches of the tops of plants. This means that fluorescent lights are not usually a good light source for big plants (over 3 feet). You can use fluorescents with big plants if you have lights above and along the side of the plant. 3. High Intensity Discharge (HID) lamps – These include metal halide (MH) and high pressure sodium (HPS). These lights are traditionally used for lighting large areas such as gymnasiums, warehouses and parking lots. Today, they are the primary choice for indoor plant growth. HID lamps are 4-8 times more efficient than incandescent lamps. These lamps have a high light output, (and produce a lot of heat) so they should be placed about two feet or more above the top of the plants. Metal halide lights have a wider range of wavelengths so they are a good all purpose light able to be used in all stages of plant growth, seedling, vegetative and flowering. I use high pressure sodium which have a higher intensity of light per watt compared to MH, but they also emit more red and yellow light. This is great for promoting flowering and fruit. In spite of this, they are not the best light source for seedlings. A MH conversion bulb is a good option for vegetative growing plants, but it may be more economical if you have the room to have one area with fluorescent lights for seedlings, and young plants, and when the plants get bigger put them in another area where you promote flowering. 4. LED or Light Emitting Diodes – These are a new lighting source for growing plants indoors. These lights are very efficient, using very low amounts of electricity and giving off minimal heat energy. However, they emit light in a very specific range. This could mean that plants do not get all the light wavelengths they need, or it could mean that plants get just what they need and nothing more. The idea is that you don’t go any further by over filling your gas tank vs. a full tank, so why use electricity to provide light that plants won’t use. There are numerous experiments testing to see what percentage of red and blue light an LED needs to promote good growth and flowering. One thing has been established by scientific studies: You will not be able to grow a plant with just one color LED! All LED for indoor growing should have red and blue, and possibly yellow, although testing is underway in many labs around the world looking at what amount of each color is best for different plant species. You could definitely use a single color LED to supplement your current lights. You could use blue LED with HPS during vegetative and early flowering to reduce internode length or use a red LED with MH to promote and improve flowering. I will end this letter discussing how to measure the amount of light your plants have available to them. The light used for plant growth, i.e. the energy absorbed by plant pigments, is different than the light absorbed by human pigments in the eye. This means that the foot-candle which is based upon the sensitivity of human eye pigments (light in the 550-560nm range) is a poor measure of light for your plants. Before you throw out your foot-candle light meter however, keep in mind it can still be used for measuring light intensity and how well light is spread evenly in your grow area. Foot candles are a measure of light intensity. While a lamp (the source of the light energy) produces lumens. Lumens are a term for measuring the visible output of a lamp or “bulb”. A standard 60 watt incandescent lamp is rated at an output of 900 lumens. A 400 watt metal halide lamp produces 36,000 lumens and a 400 watt high pressure sodium lamp produces 50,000 lumens. Generally, HPS lamps are more efficient light producers (more lumens per watt), these lamps produce a range of 100-140 lumens per watt, while MH lamps produce a range of 70-110 lumens per watt. As I mentioned above, metal halides have a broader spectrum of light having more blue light while HPS has more yellow – red light as a part of their total intensity. Scientists who study light and plant growth don’t use foot-candles or lumens. A light meter that counts the number of photons is more accurate in predicting photosynthesis than foot-candle meters. Smaller growers have continued to use foot-candle meters, which as I said, measure light for humans. Foot candle meters have errors of up to 45% when used to measure light for photosynthesis (ouch!). Measuring light in scientific experiments is done in something termed Photosynthetic Photon Flux (PPF) and its units of measure are micromole per meter squared per second (μmol m-2 s-1). This term is based on the number of photons in a certain waveband, per unit time (s) on a unit area (m2) divided by the Avogadro constant (6.022 x 1023 mol-1). It is used commonly to describe photosynthesis rates in the light wavelengths plants use i.e. the 400-700 nm wavebands. I am not recommending you spend thousands of dollars on a Quantum measurement device, I simply want you to understand how light should be measured in scientific experiments. There are devices available, but most are 100’s to 1000’s of dollars, and maybe not in the budget of a hobbyist. Considering photons of light energy you should ask how much do your plants need? Keep in mind that a daily average irradiance of 26 μmol m-2 day-1 will effectively grow most species of higher plants. The maximum solar irradiance around midday of 2000 μmol m-2 s-1 is transient and is not necessary for normal plant growth since the plants growth is a factor of the average daily irradiance of light. Light intensity is important over time. This is why you can sometimes greatly improve or expand you grow room with a light mover such as a high quality Light Rail or Solar Revolution light mover. If you are giving you plants more than enough light, you can spread the light out (move it) so long as the daily average is still at the maximum. Keep average daily irradiance in mind when you are planting your outside garden if you have sun loving plants, make sure they get the sun of the midday, it might not matter that they miss a few hours of morning and evening sunlight if they are in full midday sun. This also explains why some plants only prefer morning or evening sun, they can not tolerate the full intensity of the midday sun, they prefer some shade. If you are growing a plant such as this, like an African violet and some types of terrestrial Orchids, you may only need fluorescent lights, since the light of an HID may be too intense. What ever you are growing, start with a good light source and you will be well on your way to good growing.